The summer after graduating in 1921 from OSU with his Bachelor of Science in Business Administration, Taylor went with backfield legends Pete Stinchcomb and Chic Harley to Illinois and signed on to play for the Staleys. At age 26, Taylor started at left guard in 11 of the 12 games played that season as the Staleys were awarded the professional championship. According to research by former Chicago Tribune writer Ed Stone, Taylor helped start the great Bear-Packer rivalry when on November 27, 1921, Tarzan broke the nose of Green Bay tackle Howard “Cub” Buck with a sneak punch to the face as the Staleys won 20-0. Instead of sticking with Halas as the Staleys became the Bears the following year, Taylor returned to Ohio and lined up next to former Staley teammate Guy Chamberlin as their Canton Bulldogs won the 1922 NFL Championship. The biggest crowd of their undefeated season was at Cubs Park when they beat the Chicago Bears 7-6. Taylor later served as the varsity football line coach and freshman basketball coach for the “Aggies” at the now- named Michigan State University in 1923, 1924 and 1925 before being granted a leave of absence in 1926 to join a new football league. 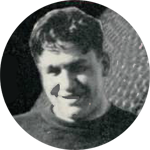 In 1926 he finished his pro career at age 31 by starting in four games for the AFL Brooklyn Horsemen, blocking for former Notre Dame icons Elmer Layden and Harry Struhldreher – half of the “Four Horsemen of the Apocalypse,” and then playing in two games with the NFL Brooklyn Lions and former Staley tackle Hugh Blacklock. In his first game for the Horsemen, Tarzan and teammate Dave Sehres received several penalties and where ultimately thrown out of the game for rough play. In 1927 he assisted with coaching the line at Ohio University in Athens and then did the same in 1928 back at Ohio State University in Columbus. He then started a long tenure in Milwaukee as the line coach at Marquette University from 1929 to 1940. When he failed to get the head coaching job there he worked a while for the Briggs and Stratton Company while also writing a syndicated newspaper column about football and scouting for several teams. In 1947 he spent one season as the line coach for the Baltimore Colts of the All-American Conference, but in 1948 was working as a labor conciliator for the Columbus-based Lustron Corporation when manufactured homes became the answer to the post-war housing shortage. In 1950 he was hired by new Packer head coach Gene “Tuffy” Ronzani [one of his former Marquette players] as the line coach for Green Bay. After working there in 1951 and 1952 he moved on in 1953 to work as a scout for the Big Ten college conference as well as for Halas’ Bears. By the time he attended the 1956 Bears/Staleys celebration at Wrigley Field at age 61, Taylor was officially listed as “retired.” Just a month after the reunion “Tarz” suffered a heart attack in the Wrigley field press room after the Bears – Rams game. He recovered but was thereafter often supported financially by football friends including George Halas. Taylor never married and lived most of his adult life in hotels near his work. Highly literate and affable, but with few worldly goods, he often said “You live to appreciate, not to accumulate.” After Taylor’s death Green Bay sportswriter Lee Remmel wrote that the rugged lineman was a Runyonesque character who “could quote Tennyson or deliver a profoundly profane appraisal of an athlete’s talents with equal facility,” and was “equally at home in a sedate bridge game or in the boisterous atmosphere of a sports bar.” Tarzan’s last request was to have one of his former players read a poem at his funeral. George Halas and Packer president Dominic Olejniczak were among the many who attended his funeral in Green Bay. Halas thought Taylor was “terrific” and recounted that “until last year, he’d always drop in to see me and tell me what was wrong with the Bears. And usually he was right.” John L. Taylor was laid to rest in Allouez Cemetery in Green Bay on May 4, 1971.